Note: This article is presented for its historical perspectives; we are not recommending all these suggestions be used today. Martha Norwalk, a noted animal behaviorist, recently addressed a gathering of GPA hound owners in Renton, Washington. My husband, Norm Smith, and I were fortunate enough to be invited by the GPA folks to attend and I would like to share my notes on Martha’s talk. Martha can be heard every Sunday morning on KOMO am 1000 from 10-12 in the Seattle area. Two of the most important topics Martha covered were health and diet, and understanding that hounds are dogs. Martha noted that many of the dogs at the event had bald thighs. Bald thighs are often an indication that the dog’s thyroid gland isn’t functioning properly. She also stated that in her experience, many undesirable behaviors have been linked to low thyroid production. A low thyroid dog may be fearful or shy, have excessive separation anxiety, claustrophobia, and may be subject to sudden explosive aggression. She recommended that dogs with hair loss and any of the above behavior problems have their thyroid function tested using the “Michigan State Thyroid Panel”. This panel is apparently one of the most comprehensive available. She stated that if the dog’s behavior is a result of low thyroid, the owner should see a significant improvement in its behavior within 42-72 hours. She also noted that a dog’s thyroid function is sometimes adversely affected by its spaying or neutering operation. So if the dog develops any of the above symptoms several months after you get it, you should keep the thyroid in mind as a possible source of the problem. Diet is also a key factor in a dog’s well-being. She personally recommends Nature’s Recipe products for dogs. She also recommends a schedule of rotating foods every three months to avoid the development of food allergies. Nature’s Recipe has several formulas which can be rotated. Common ingredients in foods which dogs can be allergic to are: wheat, corn, and soy. She strongly recommends against any foods which contain beef or beef by-products, including rawhide bones and cow hooves. She has found that beef tends to make dogs more aggressive; cow hooves can splinter. If your dog has food allergies and you want to feed him biscuits, she recommends that you buy hypo-allergenic biscuits. On the Dreaded hound Gas! On the Importance of Remembering That hounds are Dogs! They are genetically coded pack animals! When dealing with hounds, love is not enough! People who adopt hounds tend to feel so sorry for the dog that they don’t provide it with any leadership and this can lead to behavior trouble down the road. Martha was very clear that the new hound owner must be a benevolent dictator and provide the dog with a secure and predictable environment. She urged the attendees to remember that at the track these dog’s lives are strictly regimented. Too much freedom and love once they get in their new home can confuse and frighten them. She strongly recommends crate training the dog. Basically, for the first few weeks the dog should be in its crate most of the time. The dog needs to earn its way out of the crate. Why is this important? For one thing, using the crate establishes your clout. The dog learns to respect you and will look to you for all the good things that happen in its life. A dog which is given too much freedom and not enough discipline will soon begin to exhibit undesirable behavior. It will exhibit dominance or alpha behavior or it may become fearful or clingy. Crate training is the fastest way to stabilize the dog. As soon as you bring the dog home, start crate training him immediately. The dog must be in the crate any time it is not under your direct supervision. Always use a happy voice when putting the dog into its “home” or “bed”. Make them feel like they really should be happy to be in there. Teach the dog to be quiet while it is in its house. No noise. If the dog is whining, bang on the top of the crate and say “Be quiet”, in a low, firm (growly) voice. Once the dog is quiet, say “Good quiet!”, in a light and happy tone of voice. See what happens. If the whining continues, give the dog two or three more corrections. If this doesn’t work, kick the door of the crate, and use your lowest most guttural voice. Don’t be angry. If this doesn’t work try putting a towel or blanket over the crate. After the dog has been quiet for a while, you can bring the dog out into the house for five minutes at a time. Work up to thirty minutes. Remember, he needs to earn the right to be out of the crate. Most of all, don’t feel bad about putting your dog in the crate, it’s the best thing you can do for him at this stage. It takes time for them to adjust to their new situation. Proper crate training will prevent behavior problems and separation anxiety down the road! When a dog is experiencing separation anxiety, Martha looks at where the dog is crated (is it in the living room where the dog can be a part of what is going on with the family or is it stuck away in a laundry room? ), and whether the dog has been properly crate trained. Did you teach the dog what it needs to know? Martha said that this was because the dog realizes that he’s on thin ice at first, but as he becomes more comfortable “Hitler” or “Cleopatra” syndromes will develop. The real dog will come out of hiding and unless you are providing firm guidance, the situation could get out of control. So what do you do? Start crate training immediately, it’s never too late! 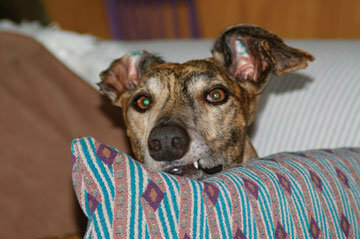 Martha believes that dogs and hounds in particular are gifted with telepathic communication skills. If you are leaving for the day don’t say, “Don’t chew the couch!,” but picture the dog calmly and happily resting on the couch. Tell the dog where you are going and when you’ll be home. Picture it in your mind. And then tell the dog that he’ll be fine. Picture it! Finally, if your dog is still having problems, even after crate training and positive mental imaging, take a look at your own emotions and those of your family. Are you stressed, angry with your spouse or kids? The dog will pick up on negative emotions and you need to be aware of how those emotions impact him. Do you want to know more? Martha has canine behavior tapes (3 1/2 hours) available for $26.00. Call (206) 827-1928 and leave your name and address and your credit card number and expiration date. She is also available for private consultations at the same phone number. Since Martha’s talk, both my husband and I have listened to her tapes and found them very helpful and we now recommend them to new and old hound owners alike. CG W 96. In 2010 Martha Norwalk is still on the radio and has a website at http://www.Marthanorwalk.com.